•	The role of manufacturers in ensuring energy storage systems are properly installed, including third-party certified installer programs. •	The importance of educating customers, cities, utilities and fire departments on the safety of energy storage systems. •	The variety and complexity of battery chemistries and technologies – differentiating chemistries. •	The importance of safety standards such as by Underwriters Laboratories (UL). CODA recognizes that energy storage manufacturers play a significant role in educating stakeholders on the proper installation and management of energy storage systems. Currently the company follows UL and ISO standards to ensure quality and safety in their products and runs a certified energy storage installer training program to ensure installation partners, such as Black & Veatch, can properly deploy energy storage products to ensure safety and performance. Once stakeholders understand the importance of proper safety measures in the context of energy storage, it is clear that safety is critical to the faster and more widespread adoption in the marketplace. 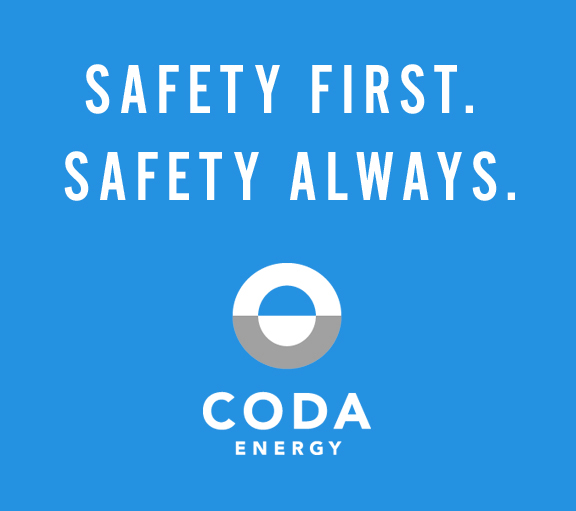 CODA Energy will also be speaking on safety at the NY-BEST Energy Storage Technology Conference on November 12th, 2015 at 2:00 PM in Rochester, NY.